Cards on the table: I had every intention of devoting this week’s What Are You Playing This Weekend? to Ubisoft’s The Division 2, perhaps the slickest, and even the most humane, of the rapidly metastisizing looter-shooter genre. (We will not be using the phrase “shlooter” in this space, thank you very much.) The Division 2 is expansive, it’s smooth, it’s got a more-than-passing interest in what rebuilding a post-apocalyptic world might actually look like, and I couldn’t give two fucks about any of it, because have you played this Sekiro game, folks? 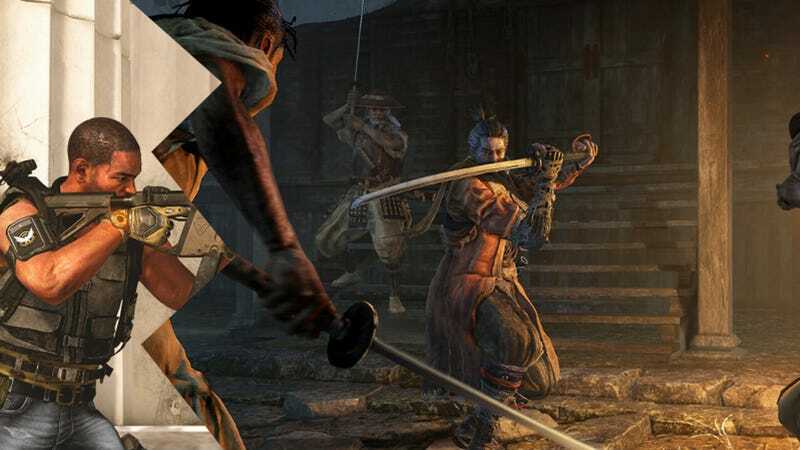 What makes this all especially galling is how hollow this continued exposure to Sekiro makes almost every aspect of its design that is not directly related to either sneaking through levels, knifing bad guys, or getting into sword fights feel. This is the least ambiguous, most openly moralistic story From has produced in years, a huge step down from the delicately shaded narratives that peek out of every dusty corner of the original Dark Souls. 90 percent of enemies are “dudes,” broken up with the occasional “big dude” or “dude who has a gun.” And with a few very notable exceptions near the end of the game, the landscapes—while beautiful—are a relentlessy same-y stretch of medieval Japanese homes, caves, and forests. Why am I doing this, I ask myself, instead of storming the Smithsonian to steal the Declaration Of Independence? (Yes, that’s something you actually do in The Division 2.) And the answer keeps on coming back: Because it’s fun as hell. Partly, you can chalk that up to delayed gratification. There’s something incredibly satisfying about icing, on the first or second try, a boss that once took me three hours of dedicated learning to take down. (Looking at you, Lady Butterfly, and your ghostly boy menagerie.) But I’ve also just fallen in love with that moment right before you swing your sword, when you’re watching to see if it’s time to parry, or to strike. That parry system is shockingly generous, once you get used to it—properly deflect the first hit of a combo, and you’re good to just sort of tap along, driving your opponent ever-more off-balance—and it all comes together to form one of the most satisfying in-your-hand games I’ve ever encountered. Hell, I don’t even mind blatant laziness like the game’s tendency to repeat early mini-bosses later on with only the most minor of tweaks: It just means more chances to apply the lessons I’ve already learned. Eventually, the spell of this single-player siren will recede; I’ve already got friends annoyed at me because I keep ducking out on communal game night in order to strike down more hapless samurai dudes. For now, though, Sekiro confirms that From’s action instincts are as sharply honed as they’ve ever been, and it’s enough to keep me playing when a mounting series of factors—including, you know, my job—tells me I should probably move on.